17 Who will be resurrected? Jesus said that “all those in the memorial tombs will hear his voice and come out.” (John 5:28, 29) And Revelation 20:13 tells us: “The sea gave up the dead in it, and death and the Grave gave up the dead in them.” Yes, billions of people will live again. The apostle Paul also said that both “the righteous and the unrighteous” will be resurrected. (Read Acts 24:15.) What does that mean? 18 “The righteous” include faithful servants of Jehovah who lived before Jesus came to earth. People like Noah, Abraham, Sarah, Moses, Ruth, and Esther will be resurrected to life here on earth. You can read about some of those men and women in Hebrews chapter 11. What about Jehovah’s faithful servants who die in our time? They are also “righteous,” so they will be resurrected. 19 “The unrighteous” include billions of people who did not have the opportunity to know Jehovah. Even though they died, Jehovah hasn’t forgotten them. He will resurrect them, and they will have the opportunity to learn about him and serve him. Who will be resurrected according to Jesus and Paul? .... “all those in the memorial tombs will hear his voice and come out” and that both “the righteous and the unrighteous” will be resurrected. Really? That's not what Jesus, Paul, or Merriam-Webster define the word ''unrighteous''. The WTBTS cannot even give you a straight answer. Why are they so scared to define the real meaning of ''unrighteous''? This sort of summarizes one of my hold up on recent teachings as when I was growing up I was under the impression that it would be everyone doesn't outright fight Jehovah and his armies in the end and that everyone would get a chance at a Satan free Earth. But the more I read recently the more it points to what the illustrations depict. I think they just don't want to hit you right off the bat with everybody dying at Armageddon except for them, that sounds a little... grim, for chapter 7, you probably know the guy you're studying with for like a month or two at that point... might turn some people off to the whole baptism thing. ".... billions who did not have the opportunity to know Jehovah. ''- That could be subjective, no? For instance, one might say they didn't really have the opportunity to know jah because some jw's who came around acted like self righteous bigoted asses therefore I didn't think they were truly Godly people and didn't want anything to do with them. Did I lose out on my opportunity or did I act in a prudent manner? 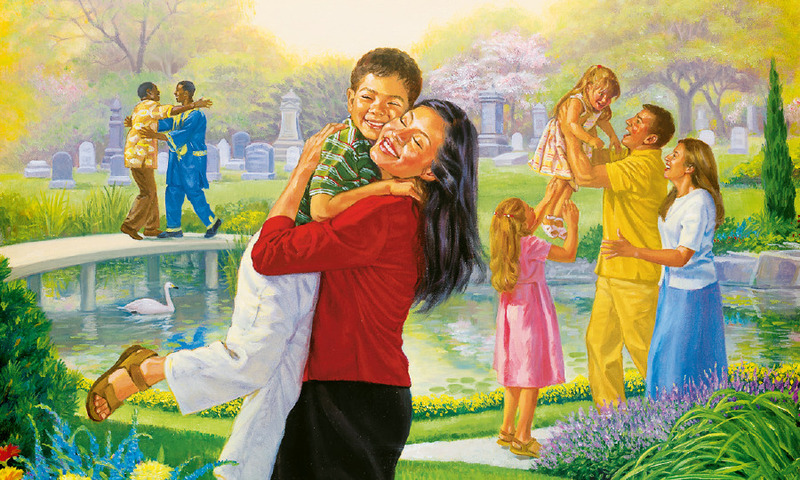 Sounds like many jw's these days believe most people will be resurrected and given the chance (once again if you missed out at the doors) to finally become good jw's. Why would anyone want to become one now in this life then? why not party up seeing as I get a second chance later when jah clones me after the big A? that's what I get from the dubland view anyway. Has anyone ever been resurrected? Is it reasonable to resurrect people? Millions of them? It is totally absurd and beyond imagination. It is easy to put in writing and induce people to conform to a cult by promising resurrections (but you have to be gullible first). It is against reason to resurrect someone, against historical facts, against biology and evolutionary experience, and also beyond anyone's ability to perform the miracle. No single person has ever been resurrected. . . except in myth and magic fairy tales. I have been thinking about this post and not sure I really have it right. On one hand jw's think everybody else will be zapped out of existence at the big A for not becoming jw's when they had the chance. On the other hand many think their loved ones will get a chance because their loved ones are pretty good as far worldly people go. Or maybe if they work hard enough for the wt some of it will spill over and it will cover their loved ones? Or maybe cult thinking is it at play and they simply hold both (conflicting) ideas in their head? Makes sense to me! Jah is going to destroy billions of people for not knowing him and then resurrect billions of people because they didn't know him! On one hand jw's think everybody else will be zapped out of existence at the big A for not becoming jw's when they had the chance. On the other hand many think their loved ones will get a chance because their loved ones are pretty good as far worldly people go. Carla: We both came to the same conclusion. That was my whole point in the post! They don't answer the question on who is the ''unrighteous'' Jesus and Paul were talking about. They come up with a half-assed answer that the ''unrighteous'' include those who never had the opportunity to know Jehovah. What does that actually mean? If all ''unrighteous'' ( wicked, sinful), are to be resurrected, does that mean that all ex-Jehovah's Witnesses will be resurrected? And, why would anyone who isn't a Jehovah's Witness or ex-Jehovah's Witness perish at Armageddon, when wicked and sinful people will be resurrected? Why do the billions living in the end times deserve death and the ''unrighteous''( wicked, sinful) who died before Armageddon deserve a resurrection? Isn't wickedness the reason for Armageddon? Yes, billions of people will live again. The apostle Paul also said that both “the righteous and the unrighteous” will be resurrected. (Read Acts 24:15.) What does that mean? Which proves once again the the bible is truly an "old fiddle" on which any tune can be played. Glad I understood something! after all these years I still can't wrap my head around jw-ism. Never will.